Ready to embrace autumn and looking for some breakfast inspiration too? 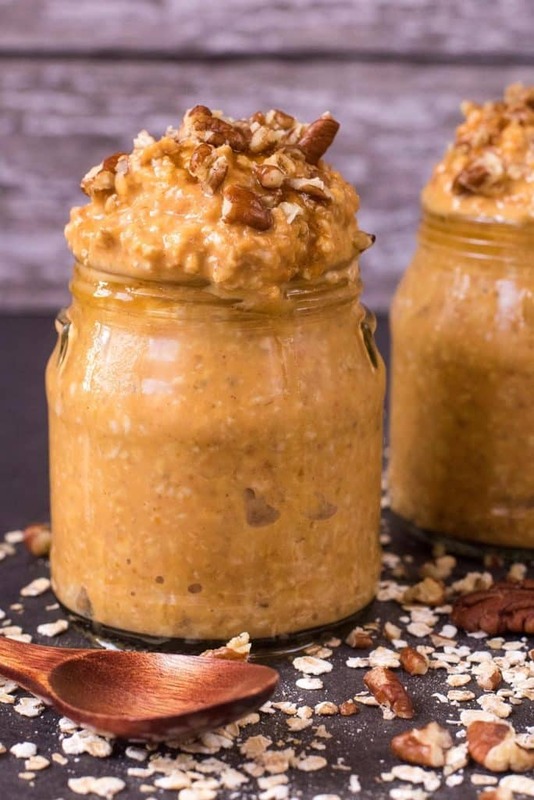 These Pumpkin Overnight Oats are made the night before, so they are perfect for a busy morning getting the kids ready for school or can be eaten on the commute to work. However and whenever you eat them, they are our little way of saying hello to our favourite season. It’s September, so that means we can start getting excited about all things pumpkin, right? A bit like when it gets to November we can finally start talking about Christmas. Whilst the pumpkin obsession just used to be for our friends across the pond in the US, here in the UK we have gotten fully on board over the past couple of years and this is one of our favourite ways to take part in the pumpkin festivities. 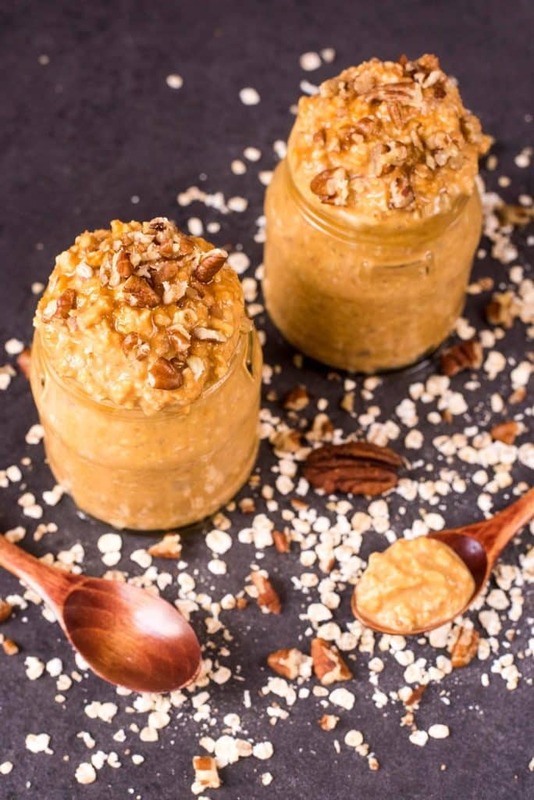 Do you want to be kept up to date on more delicious recipes like these Pumpkin Spiced Overnight Oats? Please subscribe to the blog mailing list (it takes 30 seconds). You will get sent the new recipes straight to your inbox. Your email address won’t be passed on to anyone and you will never be spammed. We love a pumpkin spiced latte as much as the next person (have you tried making your own Healthier Homemade Pumpkin Spiced Latte? ), but this gives you all those delicious flavours, but in some tasty and creamy breakfast oats. September is a bit of a strange month where it’s no longer summer, but it’s not quite time for warming breakfasts. Which is why I think overnight oats are the ideal transition breakfast to take you in to autumn. The kids are back in school, mornings just got a whole lot busier and you think you just don’t have time for breakfast. Well, if you have 5 minutes before bed, then you definitely have time to make this breakfast. You just throw in all in a bowl, mix it up and put it in the fridge and in the morning you have a big bowl of autumn waiting for you (how many times do you think I can say autumn in one post?). 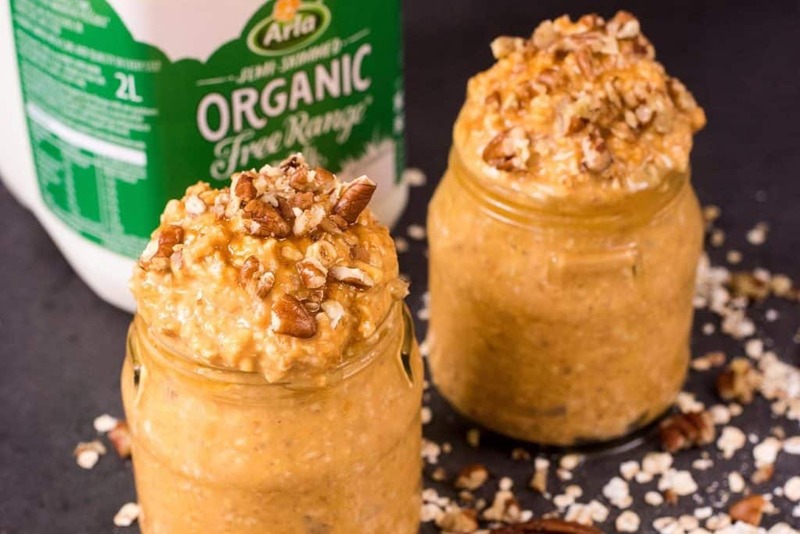 To celebrate Organic September, we have teamed up with Arla to show you how you can use their Organic Free Range Milk in your recipes and to tell you the benefits of making the swap over to organic. 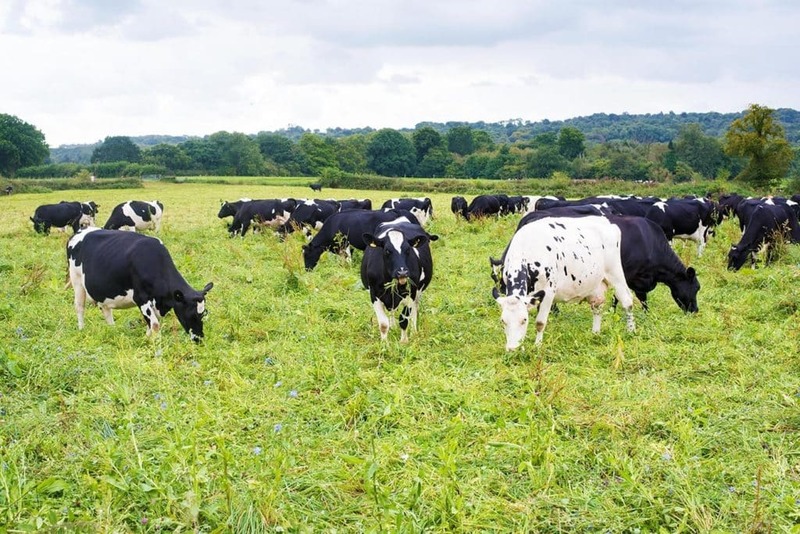 We were invited to visit one of their organic free-range farms last week to meet the organic farmers, learn about the process, meet the free-range cows and see all the work that goes in to creating their excellent quality products. So, what does organic actually mean? It means that the products you are buying have been produced to a high animal welfare and environment standard for a start, and that’s something that is really important to us. It also means fewer pesticides, no artificial additives or preservatives and absolutely no GM. All organic products come from trusted sources and they have to met a strict set of standards which define what farmers can and can’t do during production and that’s something we learnt a lot about on the day. The cows which produce our Arla Organic Free Range Milk are free range, meaning they are grazed outside whenever possible. They are only brought indoors when it would be detrimental to their welfare to be outside, for instance, if weather conditions are poor. Organic cows graze outdoors on grass and clover where No artificial fertilisers or herbicides’ are used. Instead, they rely on crop rotation, well-timed cultivation and careful selection of crop varieties. We got to see the cows enjoying some time outside and we even got to see a little calf take it’s first steps. We missed a baby cow being born my just seconds, but we saw it recovering in the grass, whilst it’s mum cleaned it up and then within minutes attempting to take it’s first steps – it was kind of amazing to be able to see that. After just a few attempts, it was up, although wobbly, and walked over to mum to have it’s first feed. Amazing. One of the things I love about Arla, and something I don’t think many people know, is that it is a farmer owned cooperative. Which means that as farmers, they own the business. 84 organic farmers are owners of Arla and (together with conventional farmer owners), they are passionate about what they do and proud of the milk they produce. Arla Organic Free Range Milk 2-litre semi-skimmed and whole milk formats are available in Tesco, Asda, Sainsburys, Morrisons and Nisa stores across the UK (rsp: £1.75). For more information, including nutritional details, visit Arla Foods. 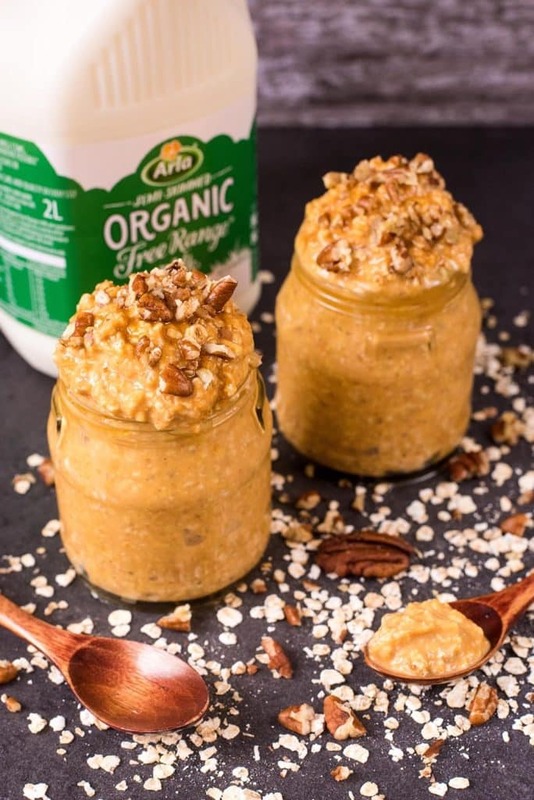 When we were challenged to come up with a recipe that used Arla Organic Free Range Milk, we knew it had to be a breakfast recipe because that’s the only time of the day we usually have milk and it had to be seasonal too and that resulted in these delicious Pumpkin Spiced Overnight Oats. 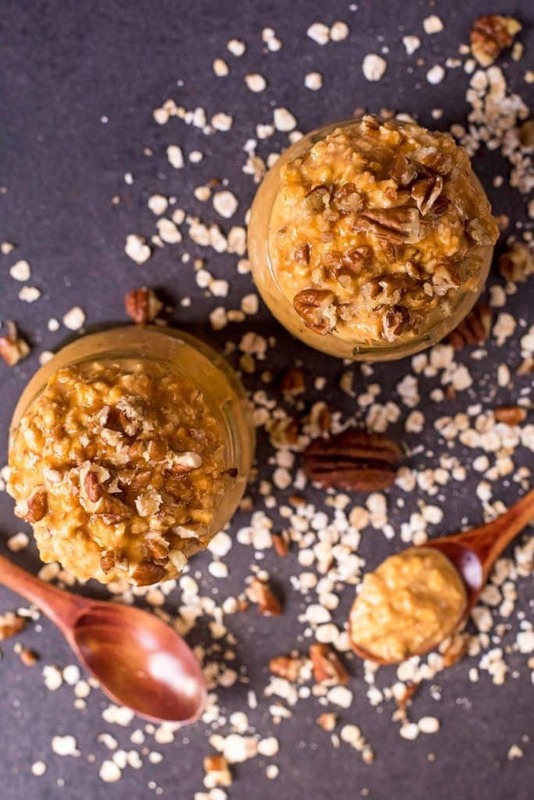 Do you want to be kept up to date on more delicious posts like these Pumpkin Overnight Oats? Please subscribe to the blog mailing list (it takes 30 seconds). 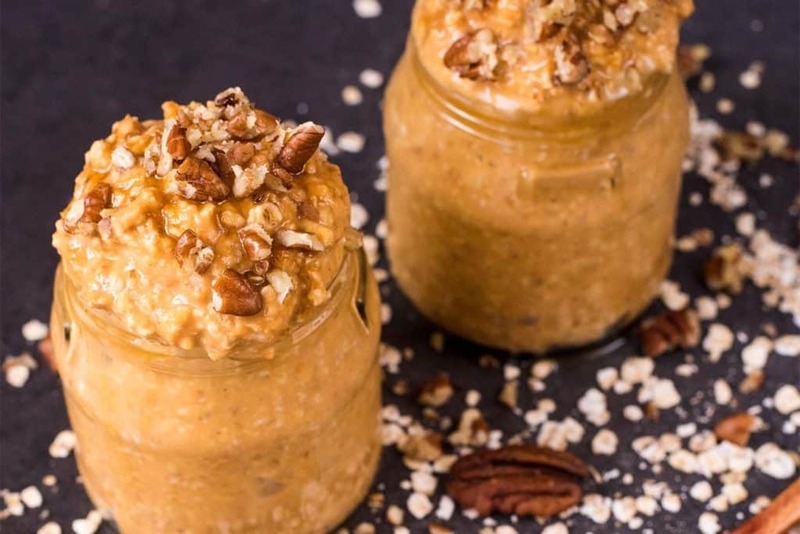 If you’ve tried these Pumpkin Overnight Oats, or any other recipe on the blog, then let us know how you got on in the comments below, we love hearing from you! You can also FOLLOW US on FACEBOOK, TWITTER, INSTAGRAM and PINTEREST to see more delicious recipe ideas, behind the scenes shots and also what we are getting up to. Put all of the ingredients in a large bowl and mix well. Divide between individual jars/bowls and put in the fridge overnight. I have some extra pumpkin puree in the freezer and now I know exactly what I’m going to do with it! 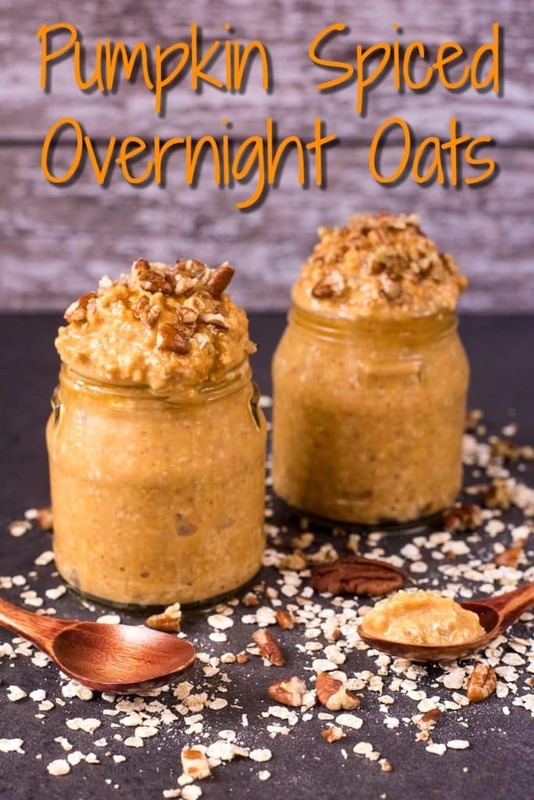 These oats are perfect for cool fall mornings! 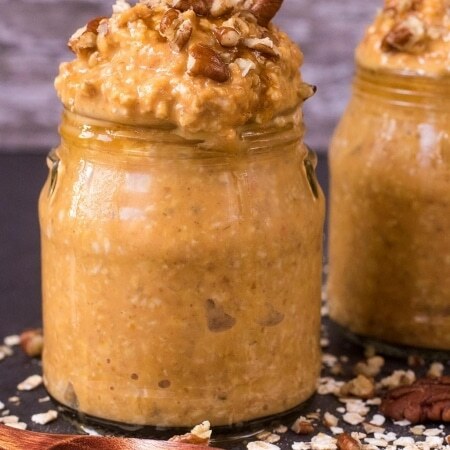 I’m not a huge fan of pumpkin flavor, but these overnight oats look incredible! 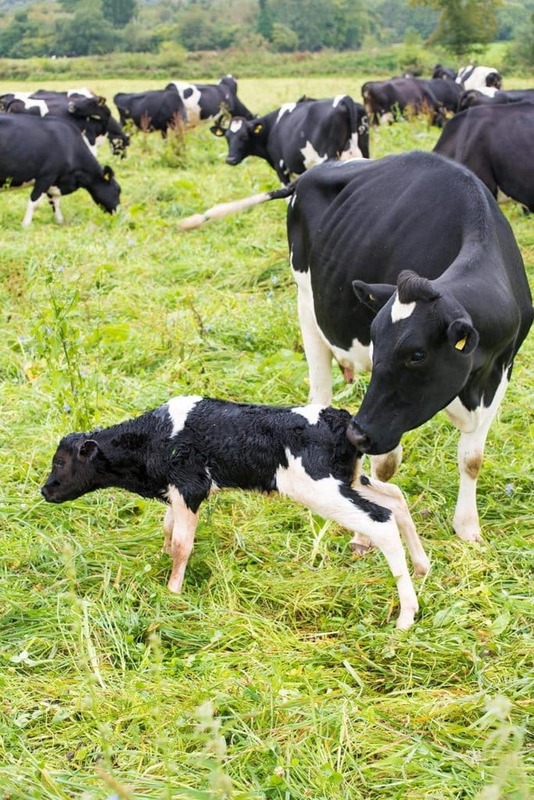 I’ve never seen a baby cow being born either… Even when we went to a farm on a school trip specifically for it, haha. I seriously woke up this morning craving a pumpkin-filled breakfast…if only I’d found this recipe earlier! …tomorrow!! Love the recipe but this is great information that helps de-mystify organic produce for the average person. 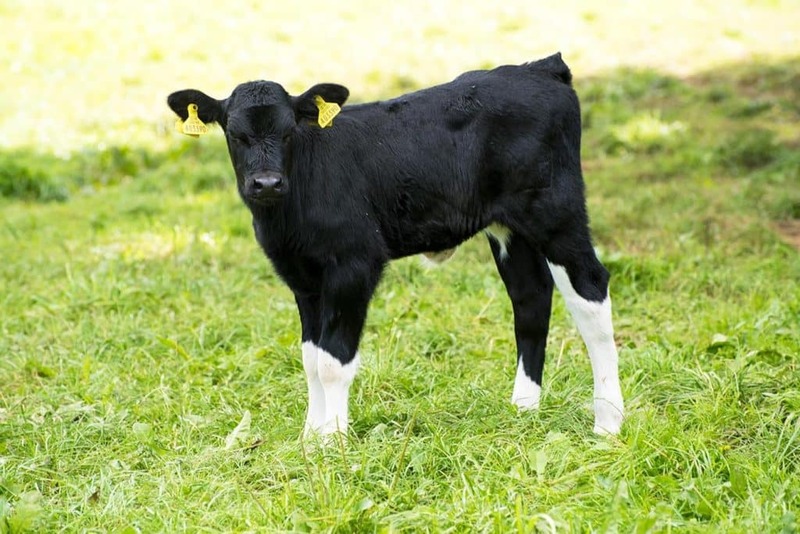 How amazing to see such a newborn calf – one of my children is cow obsessed – it would have been her perfect day out.